VANCOUVER - A B.C. judge dismissed human smuggling charges Friday against four men accused of bringing dozens of Tamil migrants into Canada illegally aboard the MV Ocean Lady. The decision comes two weeks after Justice Arne Silverman struck down a section of Canada's human smuggling law. Lawyers for the Crown and the defence agreed the B.C. Supreme Court judge should quash the charges after the earlier ruling that the law against human smuggling was unconstitutional. However, Silverman temporarily suspended his decision on the human smuggling legislation, giving the Crown 30 days to take the case to the B.C. Appeal Court. "I do have a great concern about the void and a need to protect the public with respect to incidents ... (that occurred) while the old section was in force," Silverman said in court. In a decision rendered under a publication ban and released last week, Silverman found that section 117 of the Immigration and Refugee Protection Act is overly broad because it makes no mention of human smuggling specifically. "It is clear that Canada's objective in passing S. 117 is to stop human smuggling and to protect victims of human smuggling in accordance with her international obligations,'' Silverman wrote in the Jan. 11 ruling. However, the wording is so broad that it could criminalize the activities of humanitarian workers and family members helping refugees, Silverman wrote. He declared this section of the law of no force and effect. Silverman noted in court on Friday that the human smuggling law was in place for 25 years with more or less the same wording, and amendments that took effect on Dec. 15 of last year do nothing to address the issue. However his ruling only affects the law as it was in place from 2002 until last month, he said. "That is for another case and another judge," Silverman told the court. Prosecutor Peter LaPrairie told the court that the cases against 95 people across the country were affected by the B.C. ruling. The Crown said the decision could affect not only human smuggling cases, but immigration and extradition cases, as well. There is no statute of limitations on human smuggling, he said, and there is at least one case where law enforcement have evidence of historic human smuggling that would fall within the scope of the now-unconstitutional section 117. "We can't charge that person," LaPrairie told the judge. "There is now confusion as to the state of the law." Defence lawyers had argued against suspending the decision. The law has been unconstitutional since the ruling earlier this month and no stay has been in place, argued Greg DelBigio, lawyer for Vignarajah Thevarajah. "Nobody's been released. Nobody's run amok," he said in court. Hamalraj Handasamy, Francis Appulonappa, Jeyachandran Kanagarajah and Thevarajah were charged with human smuggling after they arrived with 72 others aboard the MV Ocean Lady off the B.C. coast in October 2009. 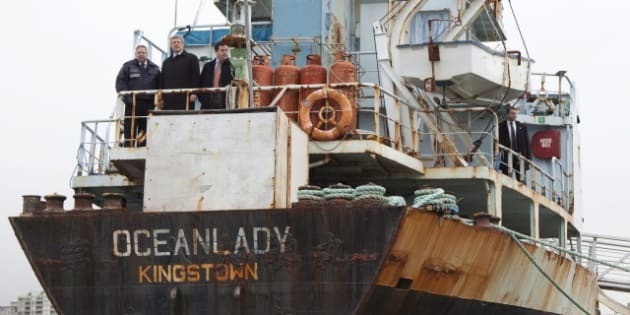 Six men face human smuggling charges in the Sun Sea case, and those prosecutions are in limbo pending the outcome of the Ocean Lady appeal.